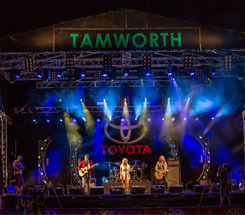 Check out the three outdoor stages #TCMF2020 has to offer, with amazing line-ups all for FREE! Located in Bicentennial Park the stage comes alive every night with the biggest line ups, biggest variety acts, on the biggest stage of the festival! Located at the intersection of Peel and Fitzroy Street, the Fanzone Stage is the heart of the CBD, jam packed full of seriously good talent every single day during the festival from 10am! FanZone also gives fans the opportunity to meet artists, take photos, get signings and purchase the latest country music CD's and merchandise. Located in the Regional Australia Bank Family Zone on Kable Avenue, the stage will be full of great talent every day of the festival for the whole family to enjoy!